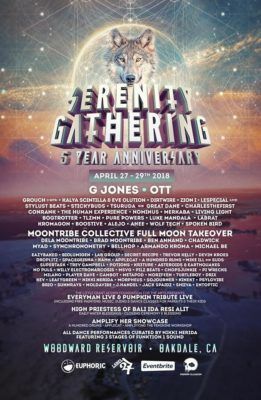 In celebration of its fifth anniversary, Serenity Gathering migrates to Northern California for the first time ever on April 27th-29th, 2018, transplanting its roots to California’s most beloved campground, Woodward Reservoir. Positive collaboration, dynamic art and a spectacular showcase of renowned beat selectors will descend upon the site to create an ethereal playground for participants to free their mind, body and spirit. Mindfully planned to coincide with the full moon rising in Scorpio, a signifier of the time to recognize the power of imagination, the creators of Serenity Gathering invite participants to move beyond the confines of ordinary life into an illuminating world ripe with possibility. An all-encompassing collective of talent orchestrates the soundscape for the celestial anniversary, including psychedelic dub master Ott, otherworldly Australian producer Kalya Scintilla and electronic Americana trio Dirtwire, whose futuristic sound beautifully contrasts that of fellow headliner Stylust Beats and his signature counterculturalist dubstep. An incredibly rare live band performance from Bay Area hip hop legends Zion I will bring their timeless sound to life on stage, adding another layer to the diverse soundtrack. Recently announced, Phase 3 of the dynamic roster include former secret headliner, one of the most talked about artists in bass music today, boss man G Jones, who will make Serenity Gathering the only California festival he plays this spring. 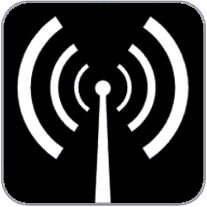 Also catch TLZMN, CharlesTheFirst, Pure Powers, plus many more! This year, the festival will pull from its vibrant past as it progresses into an extraordinary future to deliver singular experiences throughout the weekend. Playing a pivotal role since Serenity’s humble beginnings, leading lunar ambassadors of Moontribe return once again to host a Full Moon Takeover, electrifying the dancefloor under the glow of the full moon. Also planned is a heartfelt tribute to whimsical soul Pumpkin, whose lasting impact is still felt throughout the community. Serenity Gathering is known as the last festival Pumpkin played before his untimely passing, and, in honoring his legacy during the gathering’s milestone year, the very special tribute will feature live music, DJ sets, painting and dance classes for acorns of all ages. In years past, Serenity Gathering has roamed the landscape of California, touching hearts everywhere from the rolling hills of Santa Barbara, south to San Diego and then to Joshua Tree. 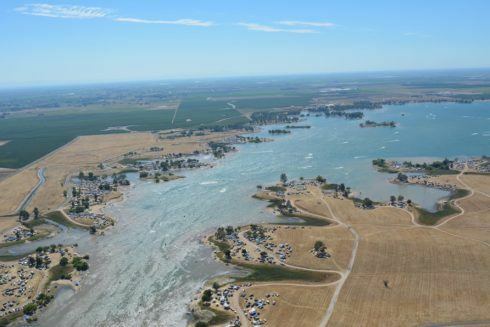 Entering its fifth year, the beloved conscious gathering has taken over the infinite space of Woodward Reservoir, expanding their festival offerings to include comfortable temperatures, serene waters and an easily accessible route from all corners of California. The gathering is working directly with the local community to establish a permanent residency atop the sprawling grounds for attendees to enjoy for many years to come. The sacred grounds of Woodward Reservoir and attendees alike will be blessed by the divine High Priestess of Bali Ida Resi Alit who will offer daily water blessings and preside over the Official Closing Ceremony, cementing the Serenity Gathering’s fifth anniversary as a sublime piece of festival history. Breathtaking views and pristine waters await as Serenity Gathering guides venturers on an intimate, mystical journey unlike any other of its kind. Join Serenity Gathering as it embarks on its fifth year anniversary — Purchase tickets here OR for your chance to win tickets, make sure to follow KSJS FM on Facebook, Instagram, and Twitter.